CHAPTER 1: General Introduction ~Dr. Anthony Bradley. CHAPTER 8: A Black Church Perspective On Minorities in Evangelicalism~Dr. Ralph C. Watkins. APPENDIX: Racism and the Church–Overcoming The Idolatry (A Biblical Theology of Race and What The Gospel Says About Racism). Vincent Bacote, Associate Professor of Theology and Director of the Center for Applied Christian Ethics, Wheaton College—Ph.D., M.Phil., Drew University; M.Div., Trinity Evangelical Divinity School; B.S. in Biology, The Citadel. Anthony B. Bradley, Associate Professor of Theology and Ethics, The King’s College—Ph.D., Westminster Theological Seminary; M.A. in Ethics and Society, Fordham University; M.Div., Covenant Theological Seminary; B.S. in Biological Sciences, Clemson University. Carl F. Ellis Jr., Assistant Professor of Practical Theology, Redeemer Theological Seminary—D.Phil., Oxford Graduate School, Memphis; M.A.R., Westminster Theological Seminary; B.A., Hampton Institute. 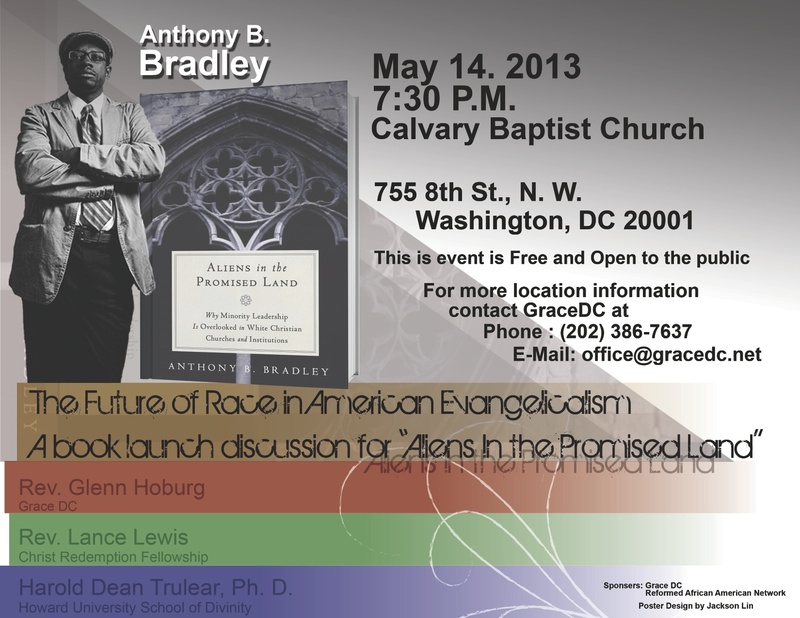 Lance Lewis, Pastor, Christ Redemption Fellowship (PCA)—M.Div., Chesapeake Theological Seminary; B.A., Temple University. Juan Martínez, Associate Provost for Diversity and International Programs, Academic Director of the Center for the Study of Hispanic Church and Community, and Associate Professor of Hispanic Studies and Pastoral Leadership, Fuller Theological Seminary—Ph.D., Th.M., Fuller Theological Seminary; M.Div., Mennonite Brethren Biblical Seminary. Orlando Rivera, Assistant Professor and Department Chair of Pastoral Ministries, Nyack College—PhD., in Organizational Leadership, Regent University; M.B.A., Rollins College; M.Div., Reformed Theological Seminary; B.A., State University of New York, Albany. Harold Dean Trulear, Associate Professor of Applied Theology, Howard University School of Divinity—Ph.D., Drew University; B.A., Morehouse College. Ralph C. Watkins, Associate Professor of Evangelism and Church Growth, Columbia Theological Seminary—Ph.D., The University of Pittsburgh; D.Min., Pittsburgh Theological Seminary; M.A., The University of Dubuque Theological Seminary; B.A., California State University, Sacramento. Amos Yong, J. Dean of the Divinity School and the Rodman Williams Professor of Theology at Regent University— Ph.D., Boston University; M.A., Portland State University; M.A., Western Evangelical Seminary; B.A., Bethany College. Make no mistake – this is not a book to be pigeonholed as merely one more addition to the ongoing conversation about faith and race. It is, rather, a book about the viability of Evangelicalism and therefore the future of western Christianity as a whole. No longer can white, western Christians conveniently turn a blind eye to their own privilege, underlying racism, and the absolute necessity of repentance and change. The question is, will the blind eyes be opened? Will evangelicals heed the prophetic word offered by the voices in <em>Aliens in the Promised Land</em>, or will we fade into obscurity as the rest of global Christianity comes to resemble a body of every tribe, tongue, and nation? I’ve heard it said that Christians sometimes answer questions that no one is asking. Here, Bradley and a host of emboldened pastors, scholars, and theologians answer questions that many Christians are afraid to ask. As such, the volume serves as a significant catalyst for conversation, prayer, and the hope that the faith once delivered can indeed be proclaimed and revealed by a diversity of members within the body of Christ. It is an effort worthy of the highest commendation. ~Rev. Adam S. Borneman, Second Presbyterian Church, Birmingham, AL. 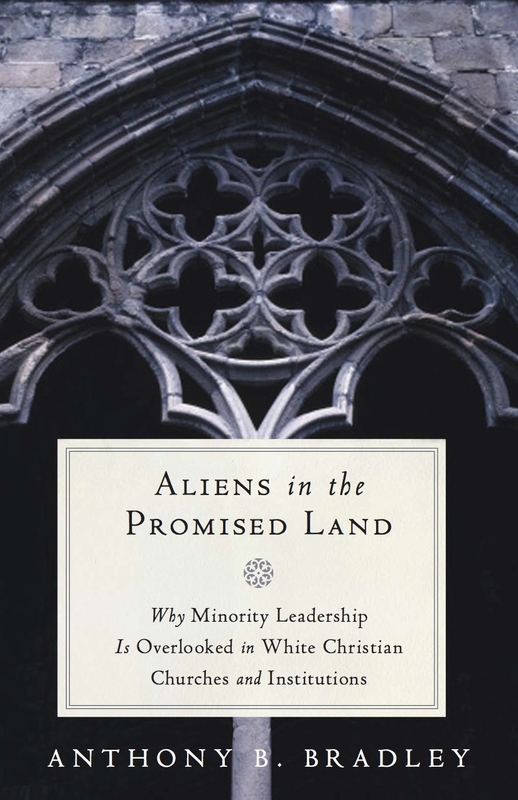 As an African-American pastor in an white evangelical denomination, I must say that Aliens in the Promised Land: Why Minority Leadership Is Overlooked in White Christian Churches and Institutions offers no easy way out or loop holes to the problem or race and ethnicity in our churches and institutions. It calls us through the insightful experiences and expertise of its contributors to look and dig deep into our hearts, actions and faith. I left this book begging God for mercy for His church and for me. I learned that we have all dropped the ball and have been dropped on in some way when it comes to overlooking minority leadership. This book is a must read for evangelical leaders of churches and religious institutions. If more of what this book offers is not embraced by evangelical leadership, they will continue to deform in their growth while quenching God’s grace. ~Rev. Howard Brown, Christ Central Church, Charlotte, NC.